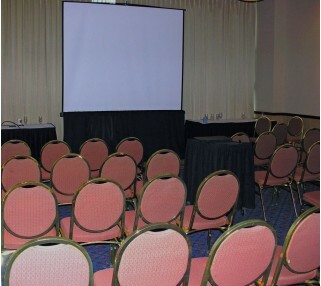 Rent this tripod screen for Powerpoint or video projection for up to 50-75 people. Indoor use only. 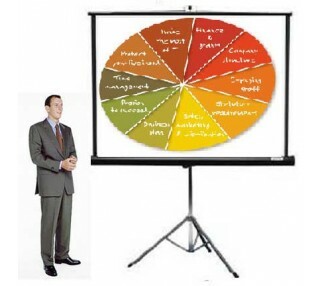 This 7 foot video screen rental is ideal for small to medium-sized audiences viewing a presentation or video. The Da-Lite Picture King screen features a matte white screen surface - the most versatile projector screen surface on the market. Light is evenly distributed over the viewing area and colors remain bright and life-like, with no shifts in hue. Setup and transport are easy. If you also need a projector, see our appropriately paired 2000 or 2600 lumen projectors. Also see our Projection Packages section for perfectly paired projector and screen packages for any size audience.